Erin Marty has been writing since 2000 and has accomplished many achievements since, including volunteering as a reading and writing tutor for elementary students in 2004. Marty also has self-published the novel “Free-Roamers: Mourning Grove." Currently, Marty is working on her prequel, “Northern Plains,” to be published in 2012. Some people may eat fish for fish oil, or take fish oil supplements in order to maintain their health. Most of the benefits that fish oil offers come from its generous supply of omega-3 fatty acids, otherwise known as “good” fats. These good fats can reduce inflammation, which can result in problems such as high blood pressure. The American Heart Association states that omega-3 fatty acids may slightly lower blood pressure. 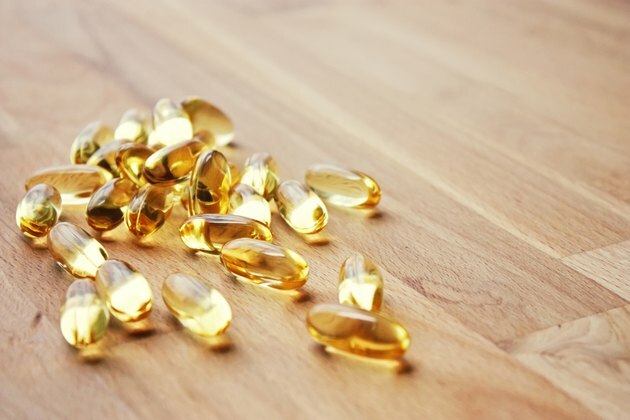 One of fish oil's best known benefits is that it can help your heart by aiding in the reduction of blood pressure. You can consume fish oil either by taking fish oil supplements or by eating fish. Salmon, mullet, tuna, mackerel, herring and trout offer generous amounts of omega-3 fatty acids. Omega-3 fatty acids are what give fish oil the ability to help lower blood pressure. MedlinePlus explains that 1 gram of omega-3 is in about 3.5 ounces of fish. Omega-3 fatty acids are essential for your survival, and are considered “good” fats. Your body, however, cannot create these on its own; this is where your diet comes in, either by eating omega-3 rich foods like nuts and fish, or taking fish oil supplements. It's not fully understood how exactly omega-3 fatty acids from fish oil lower blood pressure, but Dr. Liz Miller's website, Mind 1st, explains that omega-3's effects on blood pressure are more than likely due to both its anti-coagulant and anti-inflammatory abilities. Omega-3 contains both eicosapentaenoic acid, or EPA, and docosahexaenoic acid, or DHA. Both are important, but Miller reports that EPA is especially healthy for blood pressure because it helps your body to create eicosanoids -- hormones that not only thin blood but also fight against inflammation. Dr. Miller explains that thinner blood may help to take pressure off the heart by helping your blood flow more efficiently. Eicosanoids also help to restrain the population of proteins called cytokines, which induce inflammation. This is significant, as inflammation is linked to high blood pressure. In 2002, the “Journal of Hypertension” analyzed 90 different trials of fish oil on blood pressure, from the years 1966 to 2001. The majority of the experiments included participants taking high doses of fish oil, with a median amount of 3.7 grams daily. The fish oil was shown to decrease both systolic blood pressure and diastolic blood pressure. The conclusion was that high amounts of fish oil may help to lower blood pressure. What Is the Difference Between Flaxseed Oil & Evening Primrose Oil?